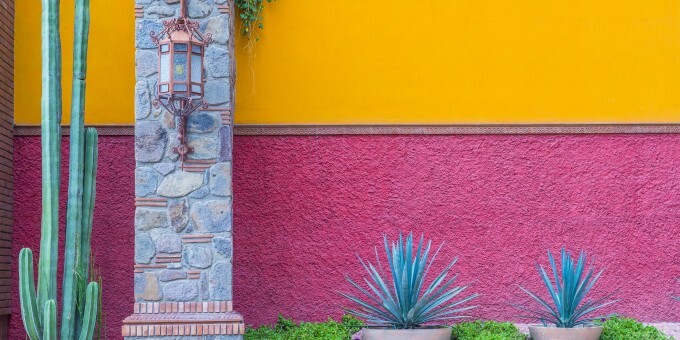 The state of Chiapas, in southern Mexico, is one of the country’s most attractive areas of outstanding natural beauty, and a large part of its attraction is the abundance of wilderness engulfed by a constant carpet of greens and turquoises which are a reflection of the rich fertile earth here. Lakes (like the Lakes of Montebello) and rivers are everywhere: the climate is tropical and the rains that help to keep these lands fertile also create some spectacular water features that roll over and down into deep valleys and gorges. The result is a series of inspiring waterfalls; many of which are easily accessible thanks to local co-operative groups which have created roads, pathways and trails leading into the jungles where some of these natural wonders hide away. This guide introduces you to three of the most impressive waterfalls in Chiapas, which are close enough to other destinations and places of interest so they may be easily included as part of a travel itinerary when you’re visiting the area. Misol-Ha (Near Palenque) – named after the river Misol-Ha, the water falls nearly 120 feet into a refreshing pool below. Agua Azul (Near Palenque) – The turquoise-blue waters of this waterfall and river are one of the state’s most beautiful and famous natural attractions. El Chiflon (Near Comitan) – Probably the most remote of the three, although worth every kilometer, this is a multi-stage waterfall featuring a stunning “angels wings” feature. All of the waterfalls are also bathing centers: bring your swimming gear and a towel. Be sure to see our Picture Galleries that offer you a visual glimpse into these wonderful natural habitats. River Misol-Ha (meaning “Streaming Water”), in the “Chol” tribe area of Chiapas, creates one of the state’s most wonderful natural sights as the river glides off the edge of a cliff and some 120 feet (35 m) down into a deep pool of water surrounded by lush vegetation. The water at the foot of the waterfall is deep (scuba divers have reported depths of 45 feet), and there are signs to warn visitors of this. You should only swim here if you are a good swimmer, and children should be watched carefully. The water is deliciously refreshing. A scuba diver who has been in the the pool has told us that it is cone-shaped and at the very center is an opening about 6 feet in diameter that is possibly a subterranean waterway which connects to somewhere further downstream. A small walkway will take you behind the water curtain created by the waterfall. There are some caves behind, which local people (waiting nearby) will give you a guided tour of in return for a small tip. Rio Xumul-Ha (meaning River of Blue Water, or in Spanish, Agua Azul) features a series of torrential cascades and fast flowing waters rolling down a limestone ridge to form pools and small streams. The limestone bed gives the waters here a turquoise-blue effect: although during the rainy season, silt turns the waters brown, so you have to time your journey right if you want to see the water blue— in which case, avoid June – October. When you arrive at the river (see below Getting There & Around), you will be greeted by a gauntlet of market stalls. Walking past these and about half a mile up the path, things return to a more natural state. On the way back, the market stalls are an ideal place to browse and buy. Local people make their living by trading here and they are the same communities which created the access routes to this natural wonder. The river is surrounded by breath-taking green valleys and as you leave the area on the road upwards, you can look left into the valley below and see the river winding through it. If it’s the rainy season (June through October), the waters are usually brown, otherwise, the eye-dazzling turquoise-blue will be immediately apparent. During the weekends, this area becomes packed with visitors and local people who come here to swim and relax: it’s a great place to do that! If you want to be surrounded by less people, come during the week and, if your schedule permits, off-season (that is, when schools are in session). The waters here can be deceptive, so caution is advised when bathing. Some areas are plainly safe to bathe in, and you’ll often see other people bathing in them. Some areas are clearly dangerous and signposted: “the liquidizer”, for example, where a rush of water drops suddenly to create an enormous swirling undercurrent. Not all places may look dangerous, so take care, and if you have children with you, supervise them and be sure they don’t stray away from safe bathing waters. People have been known to drown here, but with sensible precautions and some common sense, there’s no reason why you shouldn’t enjoy bathing in this natural wonder. About 30 minutes-drive from the colonial city of Comitan is El Chiflon, a waterfall that seemingly protrudes from the mountainside as you drive towards it and has the shape of angels’ wings. There is an Eco Center at the entrance to the Chiflon reserve, and a paved walkway that hugs the edge of the river. There are small huts and BBQ areas where people bring their own food to enjoy picnics and a day out by the water. The river has several pools and calm stretches, so bathing is possible and the water isn’t too deep—watch out for steeper areas though, where the water does become more fierce. Your climb up to the top of the pathway will be rewarded with some great views of the waterfall itself. The angels’ wings are best viewed from a distance. Close-up you can see what is called the “bride’s train” – see the photo gallery to understand why. If you want to to get closer to the main waterfall, you’ll have to do some more climbing, although the pathway has steps built into it and there are rest-stops on the way. Once at the top, there are two main vantage points: the closest is built upon a natural rock and you can expect to get wet when you get that close, although the views are quite spectacular and if the day is warm, it will provide a refreshing shower to cool you down in the jungle heat. Also See: Photo Gallery for El Chiflon. Tours – Many local tour operators include these waterfalls as part of a locally arranged itinerary. Check with local agents for current details in San Cristobaland Palenque. 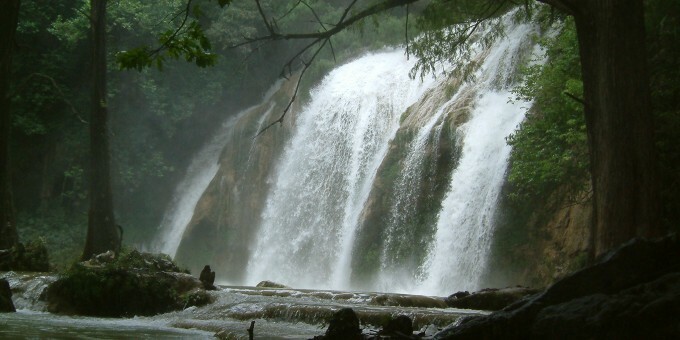 Misol-Ha – The waterfall is 15 miles (25 km) south of Palenque, about a mile (2 km) off Highway 199 (which connects San Cristobal de las Casas and Palenque). The area is sign-posted on the main road. Agua Azul – There is a sign-posted turn off the main highway between Palenque and Ocosingo on Highway 199. Agua Azul is about 22 miles (35 km) south of Palenque. Opening Days & Times: Most Eco Centers around the waterfalls are owned and managed by local communities of ejidatarios (commons land-owners). They are normally open during daylight hours and some have rustic cabins that may be rented for overnight stays. Best Times to See The Falls: The rainy season is between May and September each year and it’s then that the waters are at their fullest. However, the rains during this period stir the silt from the river beds and the beautiful hues of blue, green and turquoise reflected in the waters may not be seen (the water may be river brown after the heaviest downpours). The falls are spectacular all-year round as Chiapas is in the sub-tropics. If you want to experience the waters at their fullest, go in the rainy season; if you want to see the picturesque colors, visit in the ‘dry’ season. Ideal Clothing & Footwear: You’ll need a good, comfortable pair of walking shoes with a non-slip sole. If you have a good pair of walking boots, all the better. Insect repellent is also very useful as these areas are located in the jungle. See Local Climate, below. Swimming and Bathing: You are allowed to swim at all of these waterfalls, so bring your swim gear if you want to. Take heed of the advice regarding dangerous areas: swim only where it is obviously safe and you see others (especially locals) swimming safely. The local climate is the same as that for Palenque: jungle weather and therefore extremely hot and humid. Dress in light clothes that enable your skin to breathe. Bring sun screen, insect repellent and a hat. Carry plenty of water and stay well-hydrated at all times.